Back on the road again this morning. One last visit to the shower block, complete with the dawn chorus, then a sickly chocolaty muesli breakfast. Even the yappy ball of fluff across the way had learned his place in life's pecking order. 'Henry Horn' had done his job. 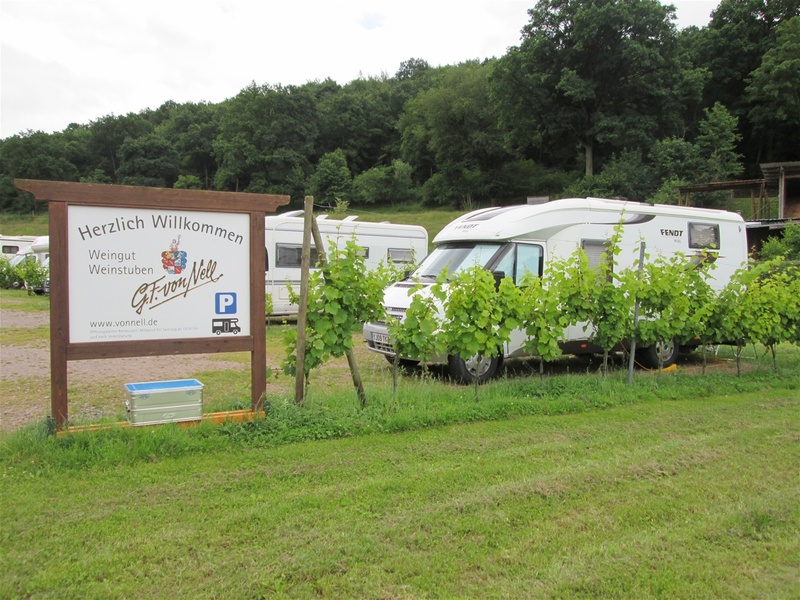 Having readied the vehicle for our trip I punched in the co-ordinates of a wine grower just outside of Trier, Germany, where we would join the tour heading north along the Mosel Valley. It told me I had about four hours of driving ahead of me. It was all motorway for the route, only about fifty miles of which was toll road, although there was a lot of navigating to do as we were continually leaving and joining short stretches of motorway. Never mind, having had lunch in a Rest Area full of fly tipping we arrived here at about 14:00. We went for a walk after settling in, we like to find the nearest bus stop and check out the timetable wherever we go. The walk in to the local community was pretty pointless. No shops, just a couple of hairdressers and lots of restaurants and places selling wine. One telling moment was when we passed a house where the eagle-eyed Chef spotted five small plaques, about 8cm square, the same size as the paving blocks around them. 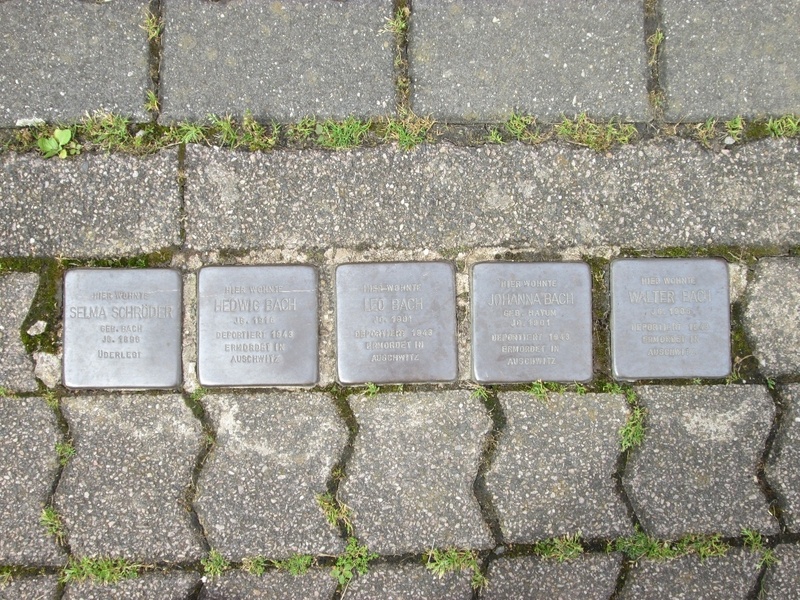 Each commemorated a German Jew, who in 1943, when the Nazi's knocked on their door were foolish enough to answer it. In those dark, evil days it was never going to be the Avon lady calling. They all perished in Auschwitz. The Germans I've observed so far look to me like people who are on their way to their doctors to have some kind of procedure. They know it's going to be uncomfortable, but are trying to put it to the back of their minds. They look a bit stressed, forcing a smile. Early days yet, we'll see. Tomorrow we catch a bus in to Trier itself for a look around. Hopefully we'll then get a better feel for Der Farderland. Thankfully no noisy kids, no yelping balls of undisciplined fluff, just the wonderful sound of birds singing and communicating between themselves, surely one of the loveliest sounds God gave us. 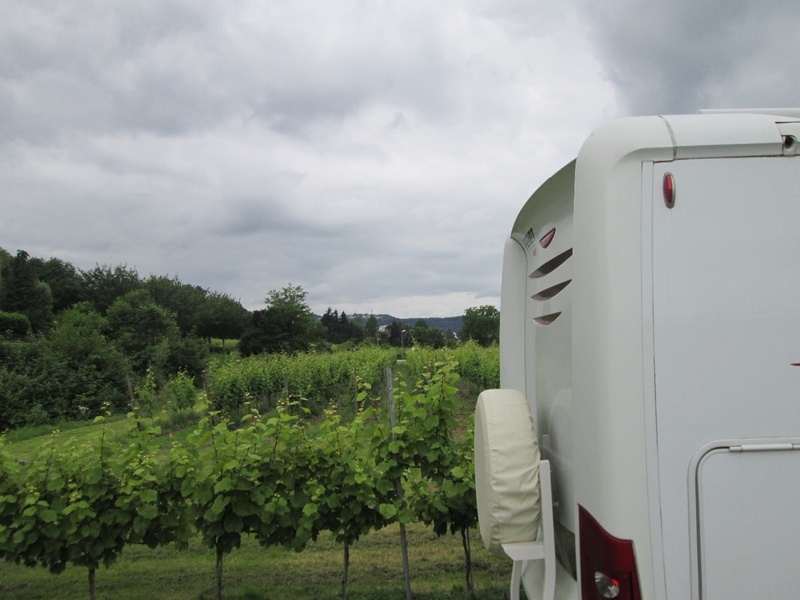 As I sat having our evening offering from The Chef I could have wound the window down and touched a grapevine within this vineyard, now you can't get closer than that can you? Today was to be spent in the local town of Obernai, for no better reason than that it was there and we are here. On entering the male shower area I was greeted by the now familiar sound of enthusiastic nasal evacuation.Quite disgusting. Lord only knows what they suspect they've got stuck up there. A dead rat maybe, or last week's shopping. Anyway the showers were pretty good and I was soon on my way back for breakfast. Now for ages, on and off, folk have been telling us about this supermarket chain 'E. Leclerc', how good they were, and how cheap. Well yesterday we happened to pass one and decided to pop in to top up with a few bits. Firstly I tried to fill the fuel tank - nope, unmanned and the pump doesn't accept 'Visa' cards. Over then to the main supermarket. It was nothing special at all, the selection was poor and The Chef was certain nothing was cheaper than we'd been used to elsewhere. So we won't be going in to another one unless we're desperate. Our favourite chains are 'Casino' and 'Super/Hyper U', followed by 'Carrefour'. Whilst in the shop I bought a packet of muesli for breakfast, so that The Chef could enjoy the remaining Weetabix. On opening the packet this morning I was surprised to find that what I had thought were sultanas mixed in with the muesli were in fact tiny pieces of milk chocolate. It was obviously a way of bribing kids to eat the stuff. It made for a very sickly breakfast. We travelled light in to the village as it looked like being a pretty warm day and we didn't have too far to walk. 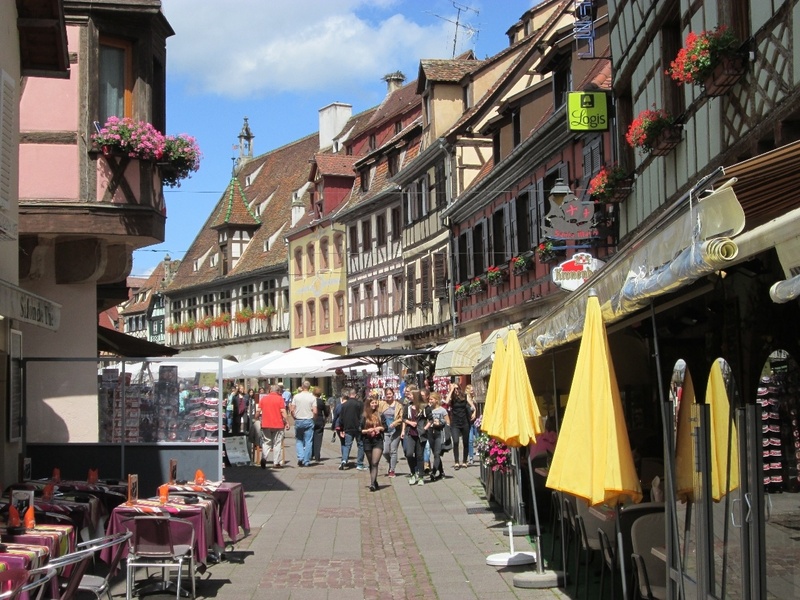 It was all a bit samey, like Turckheim or Colmar, but nothing like as nice. I have one message for the Mayor of Obernai - buy some storks! 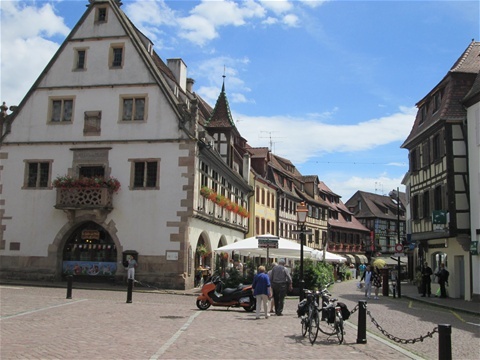 Everything in this area is very Germanic, we're not far from the Swiss border to the east, and if Germany were to invade France again from a northerly direction, then provided they set out after breakfast, they'd be here in time for lunch. We were considering splashing out on a sit down restaurant lunch whilst in the village, minimum prices were around €17 per person, plus a drink, then there's the tip. Just before we weakened The Chef spotted a small cafe where we bought two lovely ham and cheese filled baguettes and two really nice coffees which were bought out to our table, and when we paid the bill - €7. We couldn't believe the value for money. They deserved, and got, a tip on top of it. Try as we may we couldn't find enough to keep us occupied beyond about 13:30 and so we made our way back to sit in the sun and potter around. I've half-filled the fresh water tank as tomorrow we attempt to enter Der Farderland making for Trier, which is somewhere near the start of our tour running north along the Mosel. We will be on new territory indeed. I can't say we'll be sorry to leave the campsite here, we're getting too close to peak season now, so it's getting busier and noisier. The further north we've come the more yelping balls of fluff we've had to endure. They're not Lab's or other dogs of a quiet temperament, these are the neurotic, nervous, shivering, yelping things. The sort of dog I feel like picking up and drowning in a bucket of water just to shut it up. When big dogs get fed up and join in, like right now, it's like being at Cruft's. Yesterday we decided that in future any trip we make over here will end by the first of July so that we can miss the busy period. In fact tomorrow is the last day of discounted fees at this campsite until the autumn, and French schoolchildren break up on Friday 8th July as we get home on Sunday 10th, so we're sailing a bit close to the wind. So back on the road tomorrow and winging it basically, no idea where we'll be spending the nights, though I understand there are numerous campsites along the route. I've been looking at a German campsite book this afternoon, and reckon that if I cross out every third letter it will both shorten the words and make them easier to pronounce. This evening it has been necessary to deploy 'Henry the Horn' (see last trip) begger he's loud, and it seems thus far to have silenced the nasty, noisy, little dog across the way from us. I don't blame the dogs, it's the owners, but I'm afraid this evening it was the noisy little mutt that had the wax removed from his ears by 'Henry the Horn'. This evening The Chef's offering was slow cooked pork steaks with carrots, and, no kidding, Israeli new potatoes. You could tell they were Israeli because they had their skins missing.